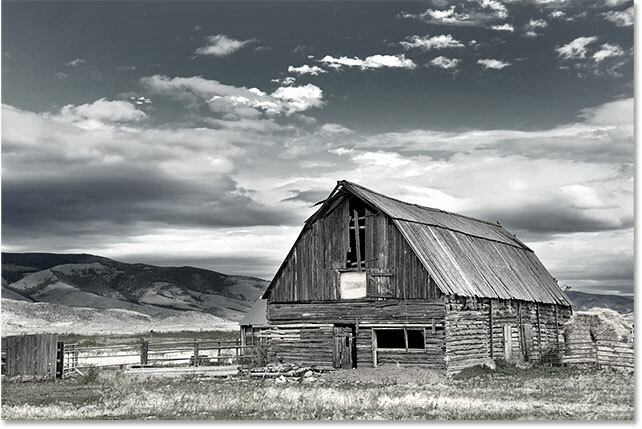 In this tutorial, we'll learn how to easily convert a full color photograph into a beautiful, custom black and white image using a Black & White adjustment layer in Photoshop! 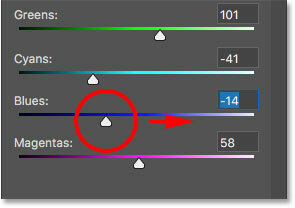 I'll be using Photoshop CC here but this tutorial is also compatible with Photoshop CS6. In Photoshop's earlier days, converting a color image to black and white was not as simple or as intuitive as it is today. At least, not if you cared about the results. 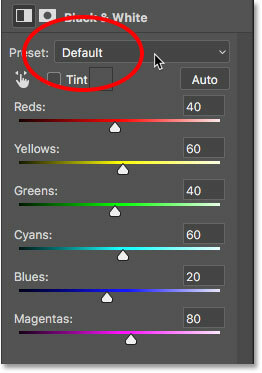 Back then, many Photoshop users simply removed the color from the image, either by desaturating it or by converting it to Grayscale. These methods were quick and easy, and can still be used today. But they offer no control over what the black and version will look like. They simply toss away the color. And a color image, suddenly without color, often looks flat, dull and lifeless. Rather than tossing away the color, what if we could somehow use the original colors in the image to help us convert it to black and white? What I mean is, what if we could adjust the brightness of specific areas in the black and white version based on the original color of those areas? What if we could darken the sky simply because it was blue, or lighten the grass because it was green? What if, instead of being something to throw away, the colors became the gateway, the key, to our black and white vision? 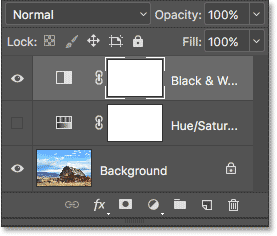 That's exactly what Photoshop's Black & White image adjustment was designed for. First introduced back in Photoshop CS3, a Black & White image adjustment lets us easily control the tonality of different areas in the black and white version using the image's original colors as our guide. It may sound like an advanced topic, but as we'll see, all it takes are a few simple sliders to turn a flat, colorless image into a black and white masterpiece. But that's not all. By applying a Black & White adjustment as an adjustment layer in Photoshop, as we'll be doing in this tutorial, we keep the effect fully editable. And, we keep our black and white version completely separate from the full color original, which means that we can even restore some of the image's original color when we're done. Let's see how it works! You can use any image of your own to follow along with this tutorial. Keep in mind, though, that while converting an image to black and white can be a great way to simplify it, remove distractions and bring focus to the main subject, not every photo will look better in black and white. If color plays an important part in the overall mood of the image, like the golden hues of a sunset, then a black and white version may not look as impressive. The original photo. Image credit: Adobe Stock. This tutorial is part of our Photo Editing and Retouching collection. Let's get started! 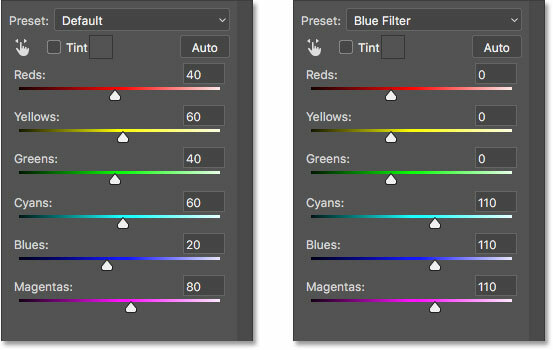 Before we look at how a Black & White image adjustment works, let's quickly desaturate the color in our image to see what we end up with. You won't need to do this every time you convert an image to black and white. We're just doing this here so we can compare the result we get from simply desaturating the image with what we're able to achieve with a Black and White adjustment. The black and white version after desaturating the color. The reason is that, even though colors look very different to us in, well, color, they can actually look very similar to each other in black and white. Depending on their shades, many of the colors in your image may share similar brightness values. When you remove the color, and all you're left with are areas of similar brightness, the resulting black and white image looks flat. What we need is a way to compensate for the similar brightness values; something that will let us lighten certain colors and darken others so that our once flat-looking image suddenly pops with contrast, detail and definition. 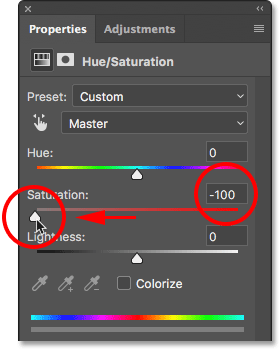 Turning off the Hue/Saturation adjustment layer. The original color image returns. 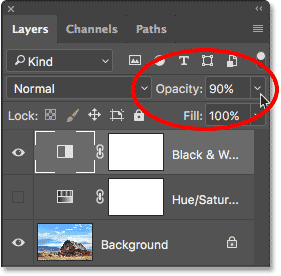 The Layers panel showing the Black & White adjustment layer above the image. Photoshop applies an initial black and white conversion to the image. 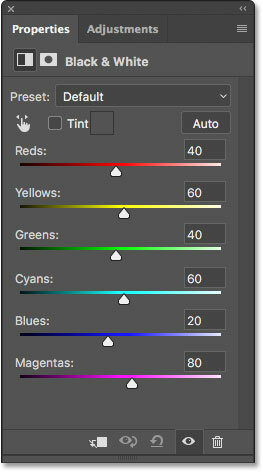 The Properties panel showing the six color sliders. Each slider controls the brightness of a different color in the image. 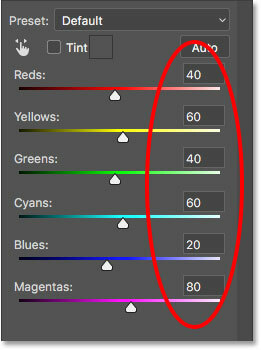 The Reds slider, for example, will lighten or darken any areas containing red. 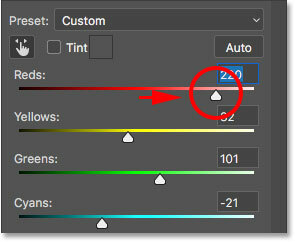 The Greens slider will lighten or darken areas of green. The Blues slider affects areas of, you guessed it... blue, and so on. Using these sliders, we can easily target specific areas in the image based on the color of those areas and then lighten or darken them as needed. The default values for the sliders. Turning off the Black & White adjustment layer. Turning the Black & White adjustment layer back on. Back to the black and white version. 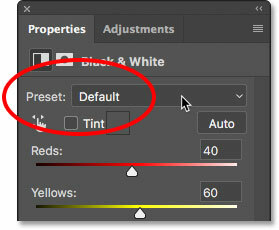 The Preset option in the Properties panel. The Black & White presets. 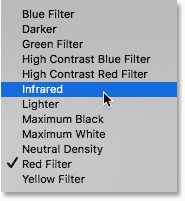 Choosing the Blue Filter preset. In traditional black and white photography, color filters are used to lighten or darken different areas in the image by allowing or blocking different colors of light. A blue filter, for example, would allow blue light to freely pass through it while blocking other colors to various degrees. This causes areas of blue to appear much lighter in the black and white image, while other colors appear darker. The result using the Blue Filter preset. 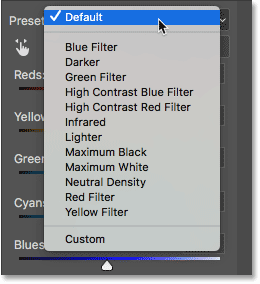 If we look at the color sliders with the Blue Filter preset selected and compare them with the default values, we get a better sense of what's happened. The default settings are on the left and the Blue Filter settings are on the right. Comparing the default settings (left) with the Blue Filter settings (right). 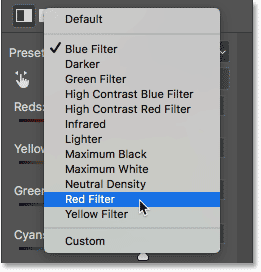 Choosing the Red Filter preset. 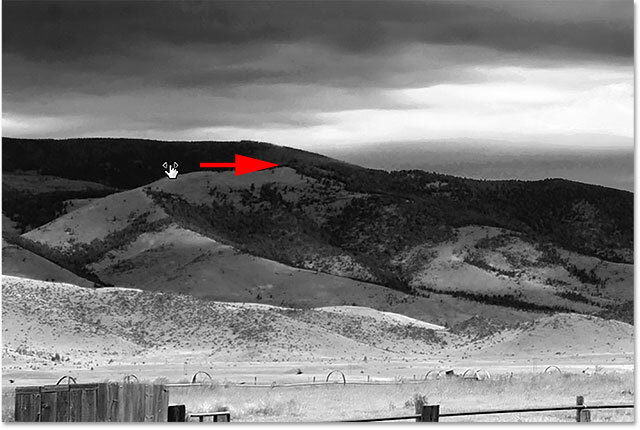 A red filter would allow red light to freely pass through it, causing areas of red to appear lighter in the black and white image, while other colors would be blocked to some degree, making them look darker. The result using the Red Filter preset. 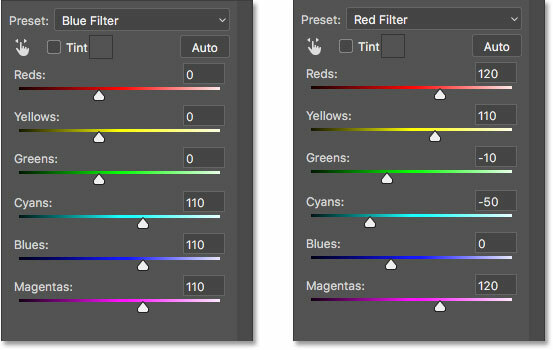 And if we compare the color slider values for the Blue Filter and Red Filter presets, we again get a better sense of what's happened. 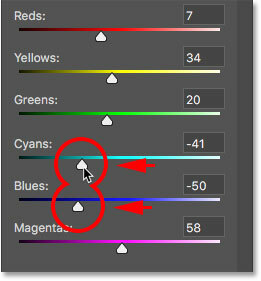 The Blue Filter preset is on the left; the Red Filter preset is on the right. Comparing the Blue Filter settings (left) with the Red Filter settings (right). Infrared photography captures light that's just beyond the visible spectrum ("infra" means "below", so "infrared" means "below red"), and it can give black and white images a magical, ethereal look. Grass and foliage become white, while skies and water darken to near black, creating striking contrast. The result using the Infrared preset. As I mentioned, we won't go through all of the presets here since you can easily try out the rest on your own. But after looking at a few presets and comparing their settings, we have a good idea of how the color sliders impact the brightness in different areas of the image. The image with the default values restored. There's one more important feature in the Properties panel that we need to look at before we start manually adjusting the sliders. That feature is the Auto button. The Auto button lets Photoshop look at the full color image to figure out what it thinks the black and white version should look like, and then lets it adjust the color sliders automatically. The image after clicking the Auto button. Comparing the default (left) and Auto (right) slider values. 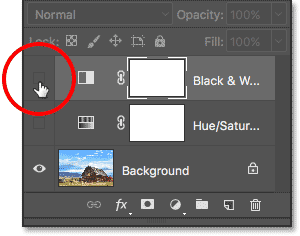 Clicking the Auto button is usually worth a try, if for no other reason than to see what Photoshop comes up with. But whether you're starting from the Auto settings, from one of the Black & White presets, or from the default settings, at some point you're going to want to take control and create your own custom black and white image. And to do that, all we need to do is drag the sliders! Dragging a slider to the left will darken any areas containing that color, while dragging to the right will lighten them. Dragging the Blues and Cyans sliders to the left. The image after dragging the Blues and Cyans sliders. Lightening the Yellows and Greens. On a related note, while grass, trees and plants may look very green to us, they actually contain more yellow than you might think. 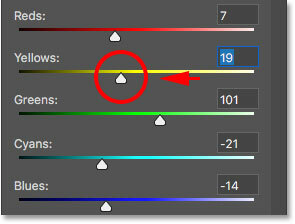 When trying to lighten those areas, you'll often find that the Yellows slider has more of an impact than the Greens. The image after dragging the Yellows and Greens sliders. Selecting the Targeted Adjustment Tool. 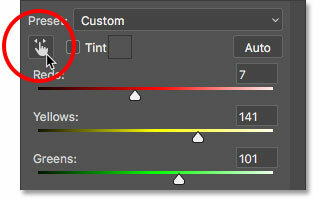 The Targeted Adjustment Tool lets us target a specific area in the image just by clicking on it. We can then lighten or darken that area by simply dragging left or right on the area itself, rather than dragging the slider. Positioning my mouse cursor over an area that needs adjusting. Clicking and holding on the area. Dragging to the right to lighten the mountain tops. As you drag on the image, the color slider moves with you. The blue sky is now lighter after lightening the blue mountain tops. Now that I've been looking at the image for a while, I'm thinking it might have been a mistake to lighten the grass in the bottom of the photo. Darkening that area would bring out more detail. Since nothing we do with the Black & White adjustment layer is permanent, it's easy to make changes and try out different ideas. Clicking on the grass and dragging to the left to darken it. Dragging on the yellow grass moved the Yellows slider. 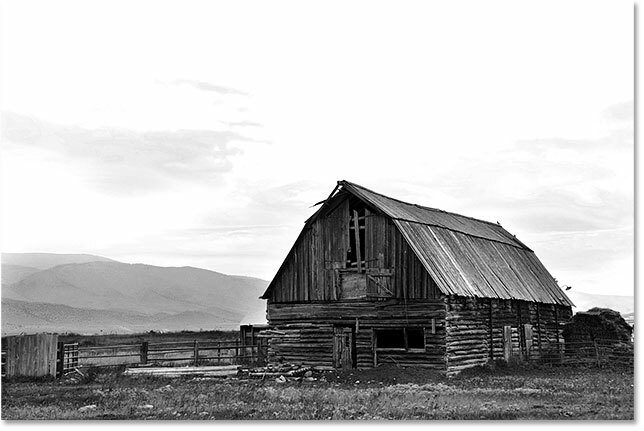 Clicking on the barn and dragging to the right to lighten it. Dragging on the red barn moved the Reds slider. In a moment, we'll learn how to easily bring back some of the color from the original image. 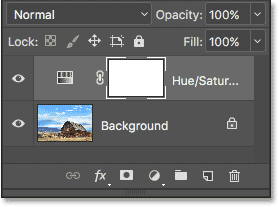 But now that we've created our own custom black and white version using a Black & White adjustment layer, let's quickly compare our result with what we first achieved back at the beginning of the tutorial using a Hue/Saturation adjustment layer. 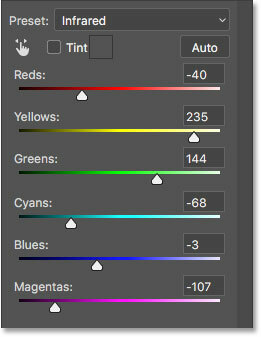 Turning off the Black & White adjustment layer, then turning on the Hue/Saturation adjustment layer. 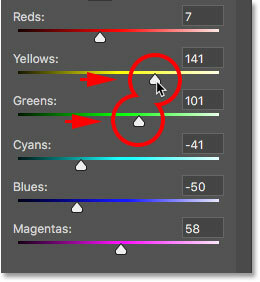 Turning off the Hue/Saturation adjustment layer, then turning on the Black & White adjustment layer. The Black & White adjustment layer version. At this point, we've learned everything we need to know to turn a full color photograph into a beautiful, custom black and white image. But just because we've converted it to black and white doesn't mean it needs to be entirely black and white. Thanks to the power of adjustment layers in Photoshop, we can easily restore some of the photo's original color. 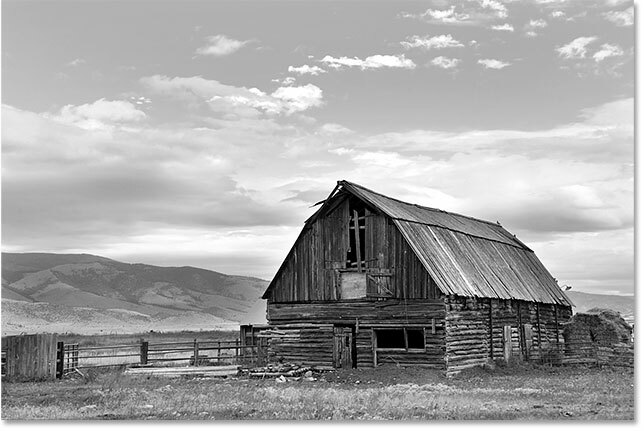 Lowering the opacity of the Black & White adjustment layer. The slightly colorized black and white version. And there we have it! That’s everything you need to know to convert color photos into stunning black and white images, along with how to restore some of the original color when you’re done, using a Black & White adjustment layer in Photoshop! Check out our Photo Retouching section for more image editing tutorials!